We are praising God for actress Letitia Wright, one of the stars of Black Panther, as she boldly shares her love for and faith in Jesus. Read how her faith has guided her career. The 61st Grammy Awards are up next in the 2019 awards season, airing this coming Sunday. As the music industry celebrates its past year’s artists and music, we have the opportunity to pray for all the performers, writers and music producers involved. Pray through the list of nominees this week, and continue praying after the awards show as you see musicians’ names in the news and on social media or as you listen to their music. Let’s ask the Lord to show each of them their value as His creation rather than finding their worth in the awards they win or lose. There are so many shows on television and we need to be praying for all of them, as millions of people across the globe watch what comes out of Hollywood. The Bachelor is one series to pray for, since it’s been in the news lately. Let’s pray that the producers and creators would recognize the value of every person, without judging their choices, and portray them as people whose identity includes the attitude of their hearts, not just their history and choices. We join our partner ministry Mastermedia International in inviting you and your church to be part of praying for Hollywood’s Big Night – The Academy Awards. The Oscars (this year on Feb. 24th) give us an enormous opportunity to spread the word to our Christian communities about the importance of praying for the entertainment industry. Mastermedia has created a guide to help you involve your friends and churches in praying for the Oscars. Join us this month as we lift up Hollywood’s most influential people to the Lord. We’re excited to pray for D.J. Soto and his growing Virtual Church! Now people from anywhere in the world can go to church in VR on the AltSpace platform. D.J.’s heart to share the gospel with people of all beliefs is reaching people who would never step into a church with the truth and love of Jesus. If you’re interested or you want to let your friends know about HPN member D.J. and his incredible ministry, click below. We need to pray for the Cuban government and their crackdown on the arts. Similar to all other controlling world leaders, they see religion and the arts as intangible threats. As HPN board member Phil Cooke states in this article, "it’s a powerful reminder that in a repressive regime, the artistic community is often the first to be silenced." Thanks so much for your prayers this month. Have a loving Valentine's Day with everyone you love, and remember this truth if you're upset with Hollywood or anyone in your life: "If you pray for someone, you can't hate them!" Did you know that Hollywood was founded by Christians? Enjoy this walking tour that tells the story of the history and spiritual roots of our iconic city. The Spotlight Workshops presents: How to Move Your Entertainment Career Forward in 2019, with filmmaker and best-selling author Phil Cooke. While walking the red carpet, we'll be praying together for the people, films, and issues involved in the 2019 Academy Awards. View details below and join us! This festival for the next generation of Christian filmmakers features short movies made entirely by youth ages 12-24. Come to the AMP Conference to equip Christians with the knowledge and confidence to fulfill the Great Commission. Watch Hollywood Prayer Network founders, Jim and Karen Covell, give their talk titled “How to Talk about Jesus without Freaking Out." We're so happy to welcome our new local chapter directors. Please feel free to welcome them via email or connect with them if you're nearby by clicking on their city name below. "Live lives of goodness, justice and truth." Steven Lindsey, executive director of the Center for Faith & Work LA, writes with an incredible understanding of God's vision for Hollywood. "Hollywood must be the only place on earth where you can be fired by a man wearing a Hawaiian shirt and a baseball cap." 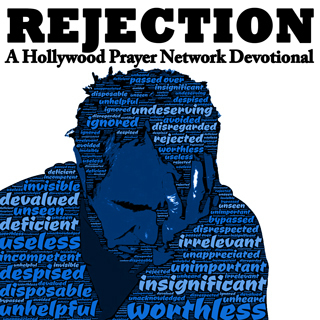 HPN's new 7-day devotional on REJECTION is now available. This week we’ll look at all of the ways we can handle rejection and learn what God says about acceptance and rejection. As cherished children of God, let’s embrace the joy of never feeling rejected again. Click the image to view it online, or find it on the YouVersion Bible app.